in Tshwane, South Africa, November 2011. In May 2012, IFAD awarded the CGIAR Challenge Program on Water and Food (CPWF) a two-year grant to contribute to improving the food security and livelihoods of poor rural communities. The IFAD grant was an opportunity to test out CPWF’s emerging technical and institutional innovations. CPWF would influence and collaborate with key change agents—including IFAD field staff—in order to scale up a number of its research innovations and findings. From 28-29 October members of the CPWF team will gather at IFAD headquarters to share the results and findings of their work, including tools and approaches for improving the food security and livelihoods of poor rural communities. 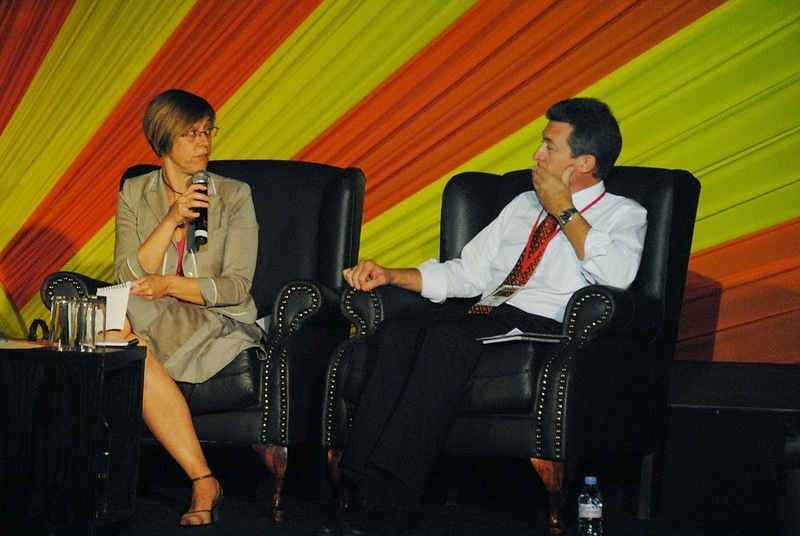 Ahead of the event, we sat down with IFAD technical advisor Audrey Nepveu (ANV) and former CPWF Director Alain Vidal (AV) to chat about challenges and opportunities for the research and development nexus. Tell us a little about the grant as it was originally conceived. In your view, what was the goal of giving this grant to CPWF? ANV: The idea of the grant came about when the last reform of the CGIAR system was launched, because it signaled that the third phase of the CGIAR Challenge Programs was not likely to happen. The Challenge Programs were structured around three phases: the first one of creativity (2003-2008), the second one focusing (2009-2013) and the third one capitalizing (2014-2018). What was then at stake was to capitalize the results achieved by CPWF, one of the successful Challenge Programs, within the compressed timeframe of the second, and now, final, phase. In those days, it was the beginning of the second phase of CPWF. Hence, the idea of the grant was to work on the existing, validated results generated by the first phase of CPWF, and capitalize them for development practitioners to use. AV: The words you have used for the three phases of CPWF are interesting from a development institution’s perspective. I am not sure I would qualify the third phase as capitalizing: we always saw it as a phase where development partners would test, adapt and scale up our institutional and technical innovations. It would have been more a ‘handing over’ phase. But whatsoever you are perfectly right that because that phase became embedded in the next round of CGIAR reform, the CGIAR Research Programs (CRPs), we needed a mechanism to engage with IFAD early enough to ensure those innovations would not remain on a shelf. ANV: Yes, and CPWF had also demonstrated its capacity to bring different people together to develop successful and practical innovations. So another dimension of the grant to CPWF was to create the space to explore what it takes for developers and researchers to work together. In what capacity was IFAD working with CPWF, and research institutions in general, at the time? AV: What facilitated this engagement were our shared common values of focusing on people, contributing to alleviating poverty and diverse partnerships. We already possessed a common language and approach to rural poverty that could help us pass the usual barriers that partners from different horizons face when engaging with each other. The actual implementation of the grant varied quite a bit from what was first envisioned. Can you talk about what changed and why? ANV: I do not completely agree with this statement. What happened was that we achieved a great level of flexibility in implementation through close coordination, and activities were adapted to explore more ways for developers/implementers to interact with researchers and their results. And I think this was highly interesting, in particular what we found did not work. For example, the format of events for researchers did not work so well for developers, and efforts were undertaken to propose meetings and events with content of direct use for developers. In a similar way, developers also had to make efforts to slow down and listen to the new ideas and tools proposed by researchers. AV: Yes, I think on both sides, the challenge was to bring both developers and researchers outside of their comfort zones, away from their normal technical solutions and science, so as to jointly start thinking ‘out of the box’ and figure out how innovations could make sense and be scaled up in a given—and often different—context. ANV: Where CPWF really surprised me though was when they decided to modify their whole working modality to build on the learnings from this grant: for all CPWF activities, developers and politicians were included in the action-research process, thus speeding up and facilitating the uptake of the results generated! AV: Indeed, but what also changed was our initial focus on CPWF Phase 1 results, as we progressively took on board the results from Phase 2. We have really learnt together what research-for-development means. What do you see as the biggest takeaways from this collaborative effort? ANV: The biggest takeaway I see is in the setup proposed by CPWF to undertake action research. This setup was demonstrated to be of interest to donors because it delivers practical results, useful tools and knowledge. It was a pleasure to attend CPWF fora organized every three years and have the opportunity to meet enthusiastic yet practical, committed researchers from a vast array of competencies. They were happy to work together and used their critical minds to push for optimum solutions. I would like this to be taken up by the latest CGIAR reform cycle with the CGIAR Research Programs. AV: The three CPWF international fora on water and food also provided an opportunity for a broad ‘water and food’ research-for-development community—including not only researchers but also development practitioners, decision makers and politicians—to mingle, interact, and brainstorm ideas way beyond the classical format of a scientific conference. It also contributed to consolidating the institutional values CPWF aimed to develop within these communities, which are now incorporated in the principles that the CGIAR Consortium tries to apply to its strategic partnerships and capacity development. ANV: Another takeaway that is not mentioned so much can be found in the ‘basin development challenges’. In each of the six basins where CPWF worked between 2009-2014, between one and two basin development challenges were identified through a six-month consultative processes. However, the funding that CPWF managed to raise in the wake of the 2008 food crisis was only sufficient to support work on one basin development challenge for each basin. There is still a second research question to tackle in each basin. That could be looked into as some of these development challenges may have become more critical in the last five years. In what ways do you think IFAD’s programming can benefit from tapping into research? How would IFAD staff and research institutions have to change to strengthen the potential for future collaborations? AV: I see a huge potential for IFAD and its programming to benefit from a better understanding of and engagement with CGIAR research-for-development in general, since IFAD and CGIAR share a lot of their values and objectives, and IFAD, unlike other lending or granting development agencies, still has a broad set of in-house technical skills. But instead of an ad hoc mechanism where CGIAR researchers or programs are brought on board a bit like consultants, we could probably try to develop a mechanism where the CGIAR pool of expertise could be brought in more systematically, especially in countries where both institutions are focusing their efforts. I think this is what this IFAD grant has also tried to explore, but there is still a long way to go. ANV: Thanks to the grant to CPWF, we did explore what would work for IFAD to interact with the CGIAR Research Program on Water, Land and Ecosystems. The Lao experience will be presented during the event. However, it takes quite some time for IFAD and WLE to understand each other, and call on the other at the appropriate moment in the project lifetime. I think that there will be a need for more sharing events, and also for displaying the tools and approaches generated by action research. Hear more about the approaches CPWF piloted for uniting research and development for poverty alleviation. Visit the event page and attend the event on 28-29 October.